A certain national brand of beer has created a mythical “Most Interesting Man in the World,” but if you had to pick someone who actually existed to fit that description, William F. “Buffalo Bill” Cody might just be the choice: a scout, hunter, outdoorsman, builder, town planner and entertainer who traveled the world putting on his Wild West shows for presidents and royalty. He was such a ladies man that even Queen Victoria sent him gifts. YellowstoneCountry.org recently posted a YouTube video nominating Cody for the “Most Interesting” title, and it’s hard to argue when you look at everything he did. One of his many signature achievements was the town of Cody, in Wyoming’s Bighorn Basin, not far from the east entrance to Yellowstone National Park. That makes Cody a huge draw in the summer, but it’s also a great getaway destination any time of year for outdoor recreation, museums, history, dining or just relaxing in beautiful surroundings. Daily flights from Salt Lake International to Yellowstone Regional (starting at $192 round-trip, flying Delta or United) take just over an hour, or you can make the scenic seven-hour drive. 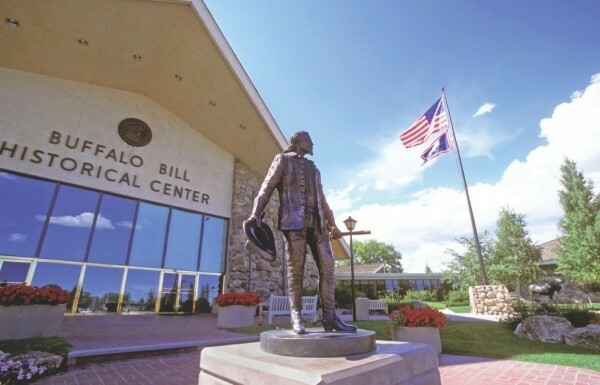 Cody features five top-notch museums—grouped together as the Buffalo Bill Historical Center (720 Sheridan Ave., 307-587-4771, BBHC.org)—in a town with a population of fewer than five digits. Within the Buffalo Bill campus, the Draper Museum of Natural History takes visitors on an interactive trail of the entire Yellowstone ecosystem, letting you learn about everything from mountain heights to canyon bottoms. The Plains Indians Museum lets you explore a rich cultural history through artifacts and exhibits. The Whitney Gallery of Western Art—yes, the same Whitneys as New York City’s Museum of American Art—displays works by masters of the genre. The Buffalo Bill Museum highlights the man himself, who was much more than a showman or guy who killed large mammals. Finally, the Cody Firearms Museum has more than 3,500 guns—enough to make even Utah legislators’ heads spin. One pass gets you into all five museums. Heart Mountain Interpretive Center (1539 Road 19, Powell, 307-754-8000, HeartMountain.org) marks the site of a World War II-era Japanese-American internment camp. The story of its more than 13,000 detainees lives on through film, exhibits, re-creations of life in the camp and monuments, including an honor roll that recognizes men and women who served America in World War II even as their families were imprisoned. Drive along the South Fork of the Shoshone River and you’ll find crevices where natural waterfalls turn into solid blocks of ice—some of them almost free-standing columns—that rise hundreds of feet at different levels, with some lasting into the spring. The result is an ice-climbers paradise, with tall formations located only a short hike from the road. If you haven’t tried ice-climbing, Jackson Hole Mountain Guides (406-270-9167, JHMG.com, $110-$375) can hook you up with an expert guide, required equipment and a safe but exciting experience. You get to wear ice-climbing shoes called “crampons” that make you feel like Kiss’ Gene Simmons. The only more empowering feeling than wearing shoes that dig into ice is getting to the top of a huge, nature-formed ice sculpture, looking down and seeing what an amazing journey you made. Cody’s other seasonal outdoor experiences include fishing, rock-climbing and mountain biking. Check out YellowstoneCountry.org for a full listing of outfitters and activities, as well as ideas for scenic drives and wildlife watching. Buffalo Bill wasn’t the only one making history in Cody. Agnes Chamberlin opened a boarding house in 1904 that became a gathering place for important meetings and celebrated visitors. It later became a hotel, and recently has been undergoing a combination of restoration and renovation that has resulted in a boutique hotel called the Chamberlin Inn (1032 12th St., 888-587-0202, ChamberlinInn.com, $95-$195) featuring classic décor with modern amenities. The Chamberlin also has a garden area where you can sit and enjoy a drink from the hotel’s Spirits Lounge. A landmark property in Cody is Buffalo Bill’s Irma Hotel (1192 Sheridan Ave., 800-587-4221, IrmaHotel.com, $60-$70), which Bill himself built and was where he lived and kept a suite of offices. You can still spend a night at this spot, which is on the National Register of Historic Places. With all of the things involving Buffalo Bill in Cody, of course you’ll find a few dishes with buffalo in them. The Terrace (525 W. Yellowstone Ave., 307-587-5868) serves up buffalo meatloaf with cranberry-chipotle sauce. You may not expect to find good Southern and Cajun cuisine in Wyoming at a place called the Rib & Chop House (1367 Sheridan Ave., 307-527-7731, RibAndChopHouse.com), but Louisiana comes to Cody there in the form of dishes like pasta jambalaya. As the name implies, there are also baby back ribs, a top sirloin baseball cut and, of course, buffalo rib-eye. William F. Cody may well have been the “World’s Most Interesting Man,” and the town named after him offers an array of most interesting experiences. The Travel Tramps blog at CityWeekly.net and host the weekly Travel Brigade Radio Show. Follow them on Twitter @TravelBrigade.